There are few events in one’s life which have as much importance as your wedding day. The coming together of months of planning to celebrate the union of you and your soon to be spouse is a joyous occasion. Throughout the day, there are all kinds of rituals and traditions you might observe, from taking photos with your bridesmaids to the actual ceremony itself. Once you arrive at your reception, there’s another important milestone to mark: your first dance with your new husband. The bridal dance is your chance to not only make memories with your spouse but also to show off your personality and kick off the celebrations with all your friends and family! Such a big moment can be a little frightening to prepare for, though. Whether you are a beginner, or you already know some dance moves, taking bridal dance classes in Brisbane can help you to get ready. At Dancecorp Dance Studios, our experienced instructors are always happy to help you gain confidence and ability in the weeks leading up to your wedding. From the traditional to the modern, we can help you to learn just what you need to know. With the inclusion of a free and private initial lesson, it’s an excellent way to prepare in a comfortable setting. 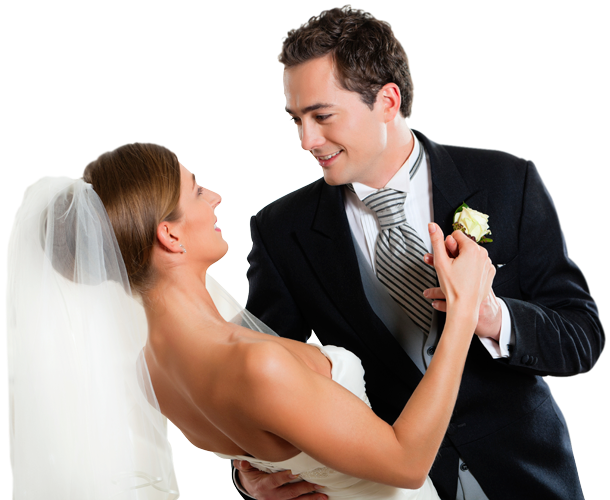 Why else should you consider coming to us for wedding dance lessons in Brisbane? At Dancecorp, we work hard to make it easy for you to feel comfortable learning with us. That’s why we give you an introduction at the first of your bridal dance lessons in our Brisbane studio. We’ll take you through the first couple of steps of your bridal dance so you can get a feel for what additional classes would entail. We always strive to ensure your comfort and confidence before moving on; our instructors will encourage you and help you develop throughout all your lessons. We can tailor your lessons directly to the song you’ve chosen for your wedding dance — and if you aren’t sure what song you want, we can suggest one! With a few months lead time, you’ll be able to nail down your dance and really “wow” your guests on your special day. More than just lessons, we teach the fundamentals to help you understand the movements you make. With the convenience our wedding dance classes in Brisbane provide, you can prepare for your first dance without any of the pressure so much other wedding planning creates. We’ll discuss your needs, assess your skill level, and create a program designed to make you feel confident. When you step out on the dance floor with your new spouse in front of your friends, you won’t need to worry about missing a step or misunderstanding the dance. We’ll make sure you’re ready! More complex and even choreographed dances are possible, time and budget permitting. For more information on our bridal classes, please call us on (07) 3227 0390 or use our contact form now.